If comments left on many BBC blogs are to be held as representative of mass opinion, then criticism of, and disillusionment with, football seem to be increasingly common. One subject tends to dominate the critical agenda - money. In part this is social snobbery. Golfers can earn fortunes without attracting the same abuse, but they tend to be middle class. Clearly, those who provide the spectacle should be rewarded. It is better to have the distortions of today than the maximum wage. There is no doubt, though, that the amount of money circulating in contemporary football does generate some dangerous sub-products. These people might be players, ex-players, coaches, agents, referees, officials or gamblers. Operating together, such corrupt elements are a major headache for the game, as made clear by the recent Europol revelations on match fixing. In 2005 the Brazilian first division was rocked by a scandal. A betting syndicate bribed two referees to manipulate results. Their usual practice was to fix the game in favour of the favourites. But there were times when, despite helping what theoretically was the stronger team, the referee was simply unable to fabricate the intended result. Football proved too strong. I take a lot of heart from that - and even more from a match played last Thursday, part of a memorable first week's action in the Copa Libertadores, South America's equivalent of the Champions League. 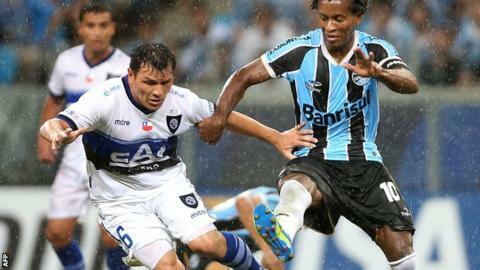 Gremio of Brazil were beaten 2-1 at home by Huachipato of Chile. The away win was fully deserved; an outcome that according to normal logic, and certainly in terms of the financial disparity between the two teams, seemed so unlikely as to appear almost impossible. A month ago the Pluri consultancy firm, specialists in sports business, ranked the squads of the 38 clubs going into the Libertadores in terms of their value. Gremio were fifth, Huachipato were 28th. And that was before Gremio went shopping. They could already count on World Cup veterans such as Elano and Ze Roberto, still in fine form at the age of 38. They had Bolivia centre forward Marcelo Martins Moreno, and had recently brought centre-back Cris and Chilean striker Eduardo Vargas from European clubs. Once they had negotiated a tricky path through the Libertadores qualifying round - needing a nervy penalty shoot out to get past LDU of Ecuador - they got out their cheque book once more. There was a flurry of last-minute activity. Andre Santos flew in from Arsenal, Argentina international centre forward Hernan Barcos joined from Palmeiras, talented striker Wellinton came in from Spartak Moscow. While Gremio were piling up the big-name reinforcements, Huachipato were moving in the opposite direction. In December - via a penalty shootout - the unfashionable club from the south of Chile won the domestic title for only the second time. But that excellent campaign placed their best players in the shop window. Left-footed attacking midfielder Cesar Cortes, the outstanding figure in the last domestic season, joined Santiago giants Universidad de Chile. The tricky Manuel Villalobos went to Iquique. Huachipato, meanwhile, seemed to have forgotten where the goal was. Before travelling to face Gremio they had played three games in this year's Chilean championship - a dire goalless draw at home to newly promoted San Marcos, a 3-0 reverse at Everton and a 2-0 home defeat to O'Higgins. And yet they deservedly beat Gremio. How did the poorer team triumph over the richer? The eye catching simplicity of well played football hides a complex reality. A player receiving the ball has a dazzling array of choices available to him. He can pass the ball in any direction at any height off either foot - or go for a dribble. Specialists have concluded that a player can be taking as many as 1350 decisions in the course of a game, continually choosing between three or four options. On Thursday night, where Gremio relied on moments of individual inspiration, especially from Ze Roberto, the Chileans' collective movement of the ball was better. Huachipato managed to bring their danger man, Uruguay centre forward Braian Rodriguez, into play in zones of the pitch where he could damage the Gremio defence. He set up the first goal and scored the second, affirming this writer's faith in football. Q: What do you think of Luis Advincula, the Peruvian who has recently joined Hoffenheim in Germany? Will he be the next Jefferson Farfan? A: No, I don't see him in the Farfan class. Last year he was very successful with Sporting Cristal operating as an attacking right-back, and I think that dropping him to that deeper role was a masterstroke. Having all that space down the flank showed off his physical capacity - he's strong as well as quick. I don't think he's got what it takes to make an impression higher up the field in reduced space. Q: As a Southampton fan, I would be interested to know your thought on Gaston Ramirez and his best position. He seems to play wide left for Saints. A: I've seen very little of him with Southampton. He clearly has a lovely left foot. Perhaps the challenge for Mauricio Pochettino is to create space for him on the field. A central role clearly gives him more panorama, but if the opponents keep things very tight down the middle - in a 4-2-3-1, for example - then it might be easier for him to go wide, and use that left foot to hit the ball diagonally into the box.